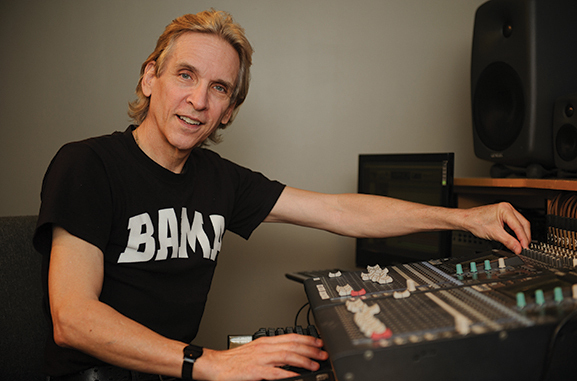 Michael Wilk, a faculty member in the School of Music and former keyboard player for the band John Kay and Steppenwolf, has designed and donated equipment for a state-of-the-art recording studio located in Bryant-Jordan Hall. Wilk learned about recording and studio design from renowned engineer, producer, and inventor George Massenburg. Michael Wilk’s fondest memory as the keyboardist with John Kay and Steppenwolf is not selling 25 million records, nor is it touring with such equally legendary performers as Lynyrd Skynyrd, Willie Nelson, or Deep Purple, all of which he has done. Rather, his fondest memory involves a large crowd and about 100,000 Styrofoam cups. It was September 19, 1987, at Memorial Stadium in Lincoln, Nebraska. Some 125,000 people filled the stands and covered the field as musical acts such as Emmylou Harris, Neil Young, and John Mellencamp took the stage for the third Farm Aid, a series of benefit concerts organized to keep American farmers from losing their land. John Kay and Steppenwolf played only two of their signature songs, “Born to Be Wild” and “Magic Carpet Ride,” but Wilk remembers it vividly. And causes are important to Wilk. A cause, music, led him to close his commercial recording service in Oregon and donate his state-of-the-art recording studio to The University of Alabama. One year later, in 2013, he also became a faculty member of the College’s School of Music. Why would Wilk, a world-renowned rock star with a half dozen gold albums under his belt, trade a gig in Oregon providing recording services to high-profile CEOs for a gig in Tuscaloosa rubbing elbows with UA faculty and students? To watch Wilk play the keyboard is like watching rain drops crash to the ground during a heavy storm – high-energy, infinitely quick, and unremitting. It appears to be the result of years of polish, the work of a person who seemingly mastered the art of playing keyboards before he could even write his name. Only Wilk’s story isn’t quite so cookie-cutter. He was a freshman in college before he ever touched the instrument. Wilk’s journey began on a different instrument, the accordion, which he remembers playing to occupy his time after he rode the bus home from school. Despite a lack of familial aptitude for the subject, Wilk’s flair for music was apparent. He won several jazz and accordion championships in New York and the surrounding New England area, where he was born and raised. By the time he graduated high school, he had cultivated only the “chops” of his right hand, which had developed its skill from racing up and down the miniature keyboard of his accordion. His left hand merely controlled the bass and timing of preset chords. “That’s why I studied music theory in college and not an instrument, because there’s no such thing as majoring in accordion,” he says. At the University of Hartford, where he received his degree, Wilk took organ lessons, which helped bring his feet and left hand up to par with his right. It also built upon the multitasking he had learned from playing the accordion. Wilk describes his razor-sharp focus playing accordion much like he describes his approach to becoming a successful musician once he moved to Los Angeles after graduating college. “If you’re going to take a swing at the pitch, you go out and take a swing at the pitch,” he says. When he arrived in LA, Wilk’s maxim was, “Keep your nose to the grindstone.” And he did. He practiced organ and synthesizer daily from 10 a.m. to 2 p.m., took advantage of free recording sessions from 2 p.m. to 6 p.m., arrived an hour early to his nightly gig in Woodland Hills in order to get a free meal, played the gig from 8 p.m. to 1 a.m., drove home, and pushed repeat. Wilk joined John Kay and Steppenwolf after responding to a flyer he saw at a recording session announcing John Kay’s need for a keyboard player. The night following the audition, Wilk received a phone call during his gig in Woodland Hills. John Kay was on the other end of the line and offered him the part. “I put in my notice with the restaurant that night, and it was the end of playing the lesser-than-large gigs,” he said. To this day, Wilk credits renowned engineer, producer, and inventor George Massenburg for the majority of what he knows about recording and studio design. Wilk met Massenberg at a paid recording session with Earth, Wind & Fire, to which Wilk was invited by then band member Al McKay. The session was held at Massenburg’s recording studio in Los Angeles. Wilk, known for his attention to detail, showed up to the session an hour before down beat, as did Massenburg. During that time, the two discussed the use of microprocessors in music and recording, the acoustic properties of a studio designed by Massenburg, and much, much more. “We’re still in touch, and the conversation continues today,” Wilk says. Fast-forward to 2011, the year Wilk first visited UA. His daughter, Mandy, was enrolled in UA’s School of Music, of which Wilk had already become quite fond. That fall, he performed at UA with John Kay and led a symposium and master class on the properties of human hearing. Though he lived in Oregon at the time, he was already thinking about how he could bring a recording studio to the school. He and Skip Sneed, professor of music and chair of the School of Music, who Wilk describes as one of the biggest Steppenwolf fans on the planet, had been exchanging emails since Wilk’s first visit, discussing details of the proposed studio. The weekend of the symposium, Wilk presented his design for a recording studio to College of Arts and Sciences Dean Robert Olin, a mathematician by trade who grasped the mathematical precision of the design and was on board, Wilk said, in an instant. While the recording studio was being built, Wilk stowed his recording equipment in the Moody Concert Hall and went to work applying his expertise in the School of Music. He recorded the school’s ensembles during rehearsals, perfecting sound levels of the concert hall’s suspended microphones based on comments from the ensemble’s director. The result was higher-quality concert recordings that resulted in better feedback to the students and higher-quality instruction. Wilk gave the director a recording to replay and analyze after every rehearsal. He also took over mixing sound levels for the Million Dollar Band. At rehearsals, he was able to automate and preset sound levels for live performances and achieve a more precise, balanced level of sound between the front ensemble and the more than 300 musicians marching on the field. He also mobilized sound control by connecting the recording console to an iPad that could control sound levels from any place in the stadium. He did the same in the next school year, 2013-2014, and added teaching a “Careers in Music” class to his list of responsibilities. The recording studio, located in Bryant-Jordan Hall, was completed in March 2014. This fall, Wilk and School of Music Professor Tom Wolfe have brought students into the mix. Through an “Introduction to Recording Techniques” class, the duo will teach students the art of recording using the equipment Wilk donated in the studio he designed. Though new to the teaching profession, Wilk has found a home. Wilk soon hopes to implement more of his designs, which include a recording system that would be transportable across venues, allow for quick set-up, provide higher-definition audio and video recordings, and offer students more hands-on learning opportunities.